Caption slip reads: "Photographer: Glickman. Date: 1956-03-04. Reporter: Glickman. Assignment: Tanaka robbery and slugging. 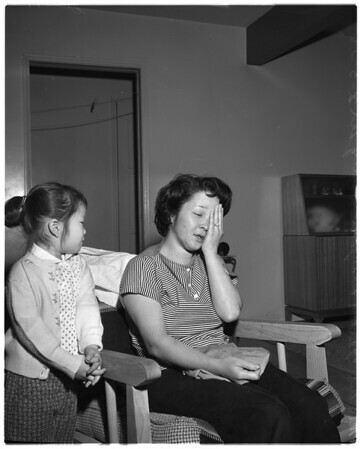 05-6-7-8: Mrs. Sue Tanaka and her daughter Beverly Sue Tanaka, age 4. Mrs. Tanaka was slugged and robbed as she surprised a burglar in her home".